what do you mean by big matrix? be specific? what's the size? How do you identify A,B,C,D and E within N? How are they distributed across N's rows? big matrix is about 30000x16. Because the zeros are at the end of each row. I have attached an example of the matrix. For example here A can be made by the first 3 rows. 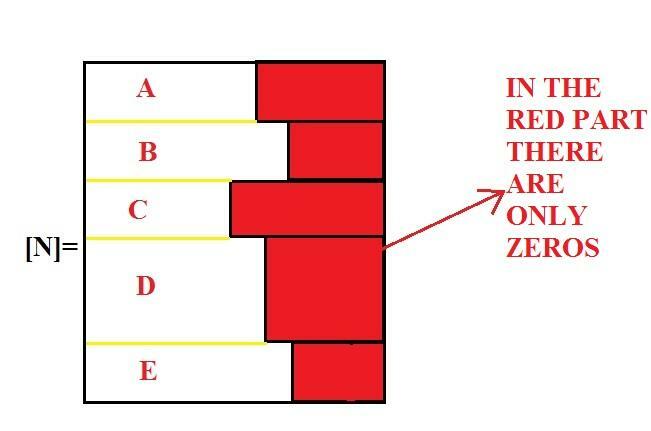 This assumes that there is no zero aside from the trailing ones on each row. We can work releasing this requirement if there can be zeros elsewhere, and on truncation to the non-zero part if you really need it. Also your code works well Guillaume and it is good because remove also the zeros. But is there the possibility to join the rows generated with the same numbers of columns ? "But is there the possibility to join the rows generated with the same numbers of columns ?" That's the whole purpose of the last three lines. My pleasure, but please see my last edits: the extra operations truncate zeros and manage cases with zeros inside the non-zero blocks!